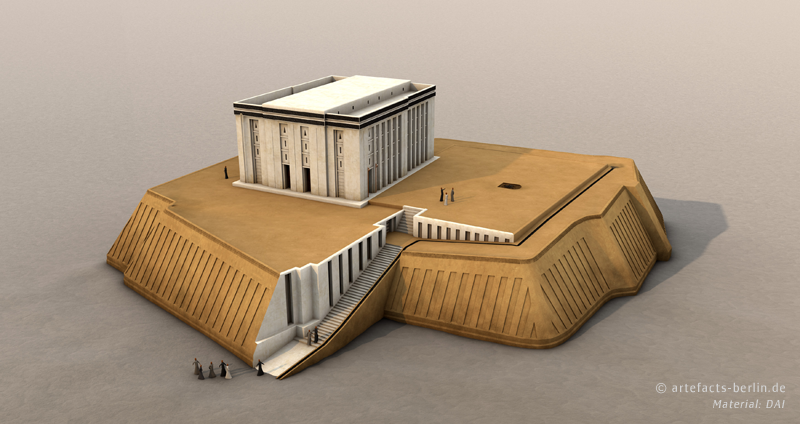 The “White Temple” of Uruk dates into the 4th mill. BCE and was visualized on behalf of the German Archaeological Institute by Artefacts Berlin. A Uruk/Warka, situated in modern-day Iraq, is one of the first cities in the world and was populated almost without interruption for over 5,000 years. In the western area of the city centre a multiple-phased terrace was discovered, the so-called “Anu Ziggurat”. The terrace was extended and raised over time at least ten times until it reached a height of about 12 m.
This last construction level featured a polygonal shape, due to its many re­confi­gu­rations, sloped outer walls as well as a complicated staircase. The surface area of the terrace measured about 45 x 50 m. The remains of an elaborated middle-hall-building, the so-called “White Temple”, were found on top of the terrace. The building had white plastered walls, which were divided by niches, multiple postaments, maybe shelves in an adjacent room as well as multiple staircases, which led to the roof or to a second storey. The erection of the building was radiocarbon-dated between 3517 and 3358 BCE. Inside view of the two-storey version of the “White Temple”. A postament in the centre was probably used as an altar. In the process of the reconstruction the team of Artefacts Berlin decided for two alter­na­tives: a one-storey and a two-storey version. The reconstructions are based on the excavation results, but also on a small temple model made from stone that was found in a corner of the “White Temple” during the excavation. The proportions and wall deco­ra­tions of the reconstruction were adopted from this model which had nearly the same ground plan as the actual building. Digital preservation of cultural heritage has become an important tool for archaeologists and conservationists. The 3D visualisation of the medieval city of Karakorum gives us new exciting insights into the very heart of the mongolian empire. Karakorum (in Mogolia) lies approximately 320 km west to the capital Ulaan Baatar and was a medieval city, that is newly excavated since 2000 by a German-Mongolian joint mission. The excavation is focused on a terrace, on which a ‘Great Hall’ was constructed. 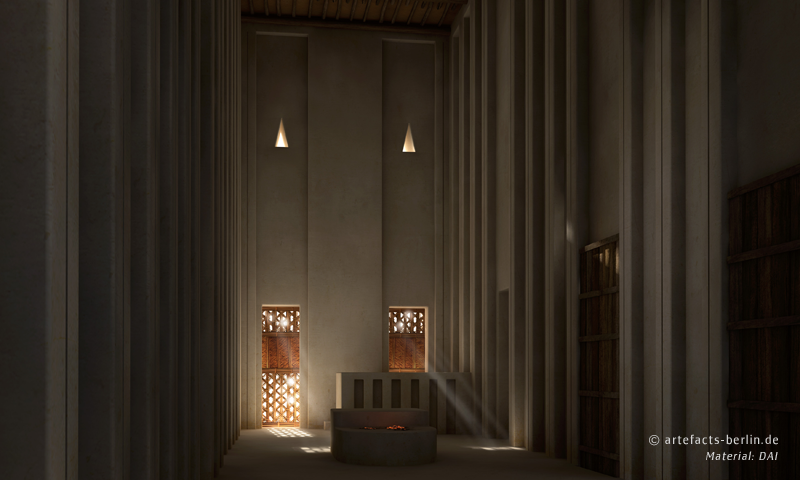 After evaluating the archaeological record, it is believed that the ‘Great Hall’ was in fact a Buddhist temple. On basis of the wall paintings as well as the architectural sculptures, a dating between the 12th and the 14th century is probable. The structure is one-phased, but features several restorations and alterations of unknown dimensions.Influences of Tibetan architecture is found in the ground plan of the central temple, that was built after the principle of a Mandala. 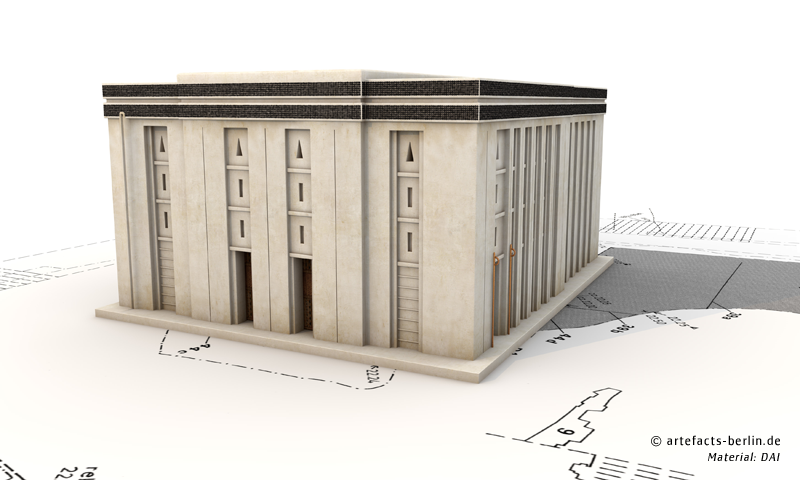 The ground plan has a square form and is structured by the inner layout of the temple. The centre of the structure was emphasized by the erection of a stupa. The overall orientation of the terrace as well as the building to the four cardinal points in the North, East, South and West support the interpretation as a building with religious function even further. 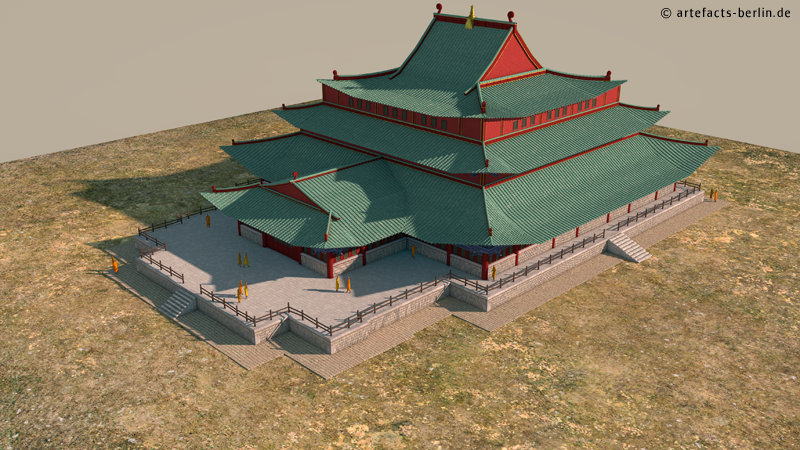 The reconstruction was visualised with an animation to be able to explain the complicated composition of the terrace as well as the ‘Great Hall’, that shows influences of Chinese and Tibetan architecture. Especially the accurate realisation of the archaeological documented results, that was given by the excavators, was important to the team of Artefacts Berlin. The animation will be displayed in a nearby museum. Therefore, the translation of the explaining texts into Mongolian is self-explanatory. 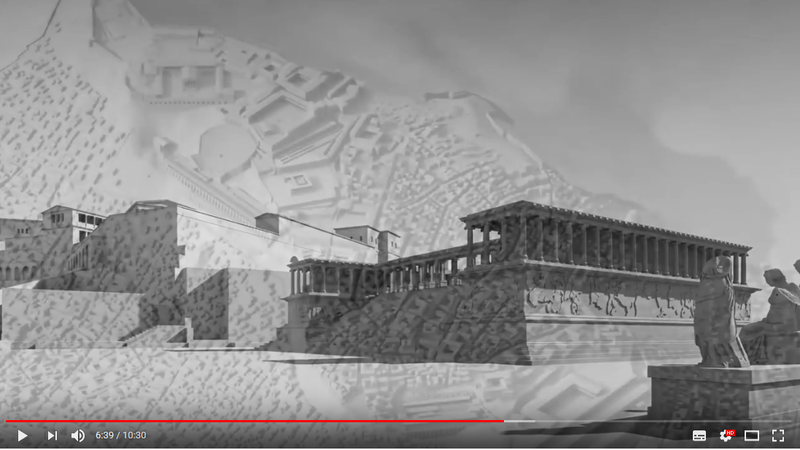 For a better understanding, the animation is divided into four parts: Location of the site, archaeological record, modern superstructure for preservation and the reconstruction of the ‘Great Hall’ itself. The project was realised by Artefacts Berlin on behalf of Dr. Christina Franken, Kommission für Archäologie Außereuropäischer Kulturen (KAAK), Deutsches Archäologisches Institut (DAI), Bonn.